Essential to every unit is outdoor space. The top floor has large terraces and landscaped roofs, intermediate floors have balconies and loggias, and the ground floor has a series of contiguous yards. A suite of community focused amenity spaces are included in the building, beginning with a large double height community room with doors leading out to a public garden. Above is a children’s playroom, and an outdoor recreation space with a gym and bike room below. 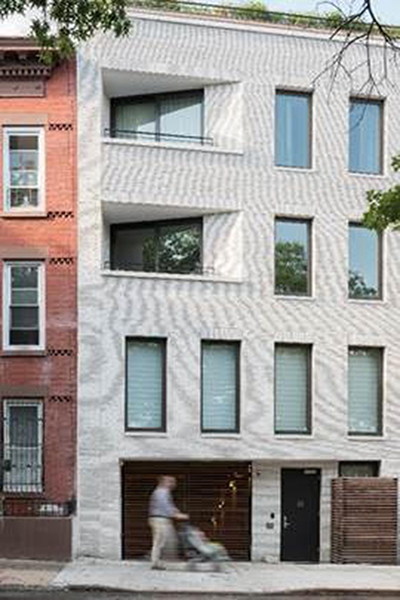 The form of the building is derived from the aforementioned irregular lot shape, and with a depth of over 130’, atypical for New York City, DXA was able to capitalize on the south facing exposures and give most units 2 or 3 exterior walls with large glass windows. The result is an abundance of natural light, which when coupled with the light and bright pallet of the interior design give the living spaces a prevailing sense of calm and wellbeing. Live-sawn white oak floors are complimented with walnut accents and Olympian Danby stone counters. Brooklyn has experienced an artistic renaissance in the last several years as lost forms of craftsmanship have been rediscovered and explored. 280 St. Marks celebrates this phenomenon in featuring many local artists and makers throughout the building. A chandelier by lighting designer David Weeks greets you upon entry, woods by Hudson Woods and Madera Trade can be found throughout, and wall paper by Flavor Paper and custom kitchen pendants by Brendan Ravenhill are integral to the decor.